""I have to tell you, you are the only chiropractic doctor who has done this much muscle work along with my adjustments, and it sure has helped me to get better more quickly."" ""My low back is lightyears better with your care!"" ""My mid-back pain is gone and it made my golf swing better- you have done wonders for me."" 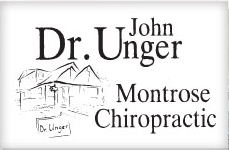 ""The care and treatment that I have received from Dr. Unger has helped me to recover from chronic back and neck problems which were aggravated by a car accident last January. In the process, I have learned a great deal about my body and ways to take care of it to help in the healing."" ""Thanks so much for helping me - treatment I got from your hands is almost like a miracle in how well I've gotten."" ""I can't thank you enough. My lower back and digestive system are so much better with your treatment.""